We start the process by meticulously choosing and cutting the grapevines, the grapevines are then placed over a solid brass insert inside the mold. Then the creative process of mixing pigments with resin has begun wherein it is poured into these molds. After several days of drying time, each stopper is removed from the mold, placed on the lathe where each unique shape gets formed. They are then coated and buffed several times over several days to get their high gloss finish. Once the stoppers are completely done, they’re finished off with a stainless steel rubber tapered stopper that is screwed into the solid brass insert. They are all made on California’s Central Coast. Each one is a unique piece of artwork. $46 each. Cork products. You’ve seen corkboards made from used corks, but what about a belt, a handbag or even an iPhone cover? 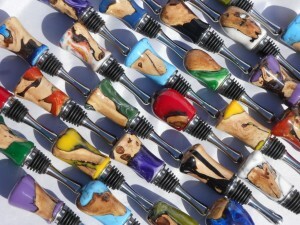 Queork is elevating cork recycling to something very useful and even stylish for WineFashionistas. There are watch straps, purses and iPhone covers, all very practical. These do not look like art school projects. The cork is soft, almost like a fabric or leather in the way that it feels. 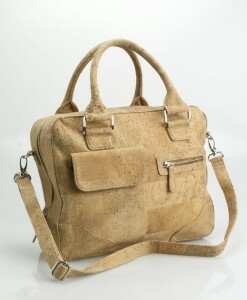 Handbag pictured is the Executive Cork Handbag, $215. iPhone cases start at $29; watch straps from $59; pet collars $27. Wine aerator. Ever since wine aerators showed up on the market, companies have been taking that idea one step further by improving the user-friendliness of the aerator. Nuance has developed The Wine Finer. What’s great about it is that the sleek aerator fits into the wine bottle so you don’t have to hold the aerator over a glass or need a stand to hold it. Not only does it bring oxygen into the wine as you pour, it also keeps the sediment out of your glass. This could replace the need for a decanter. It also comes with a lid so if you don’t finish the bottle you can just leave the Nuance in place. $29.95. 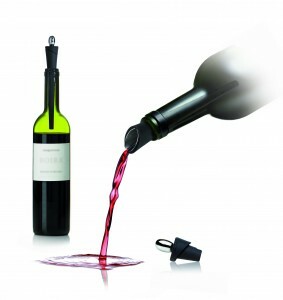 For the super wine geek in your life, a Twist adjustable wine aerator is the new generation of portable aerators. You can dial in the number of hours, from 1 to 6, that you want the wine aerator to mimic. Set the number, hold the aerator over your wine glass and pour. Works on both white and red wines. To clean just rinse. Simple and easy. $40. Wine in your lipstick. BITE Beauty has an amazing line of lipsticks, pencils and glosses that contain resveratrol (antioxidant found in red wine) and are good (and safe) enough to lick off your lips. Try out the Superfruit Butter, lip primer and balm, plus a bunch of the wine-inspired lipstick shades with the Luminous Lip Library ,which has a lip brush and mirror. Perfect for your handbag and a WineFashionista favorite. $36 at Sephora. Wine Candles. I’ve seen many candles made to go into a wine bottle, and wine-scented candles, but these recycled wine bottle candles are the coolest I’ve seen. 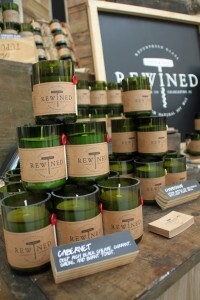 Rewined Candles repurposes used wine bottles as candleholders, with a label that looks like it has been tooled in leather, along with a wax seal. The natural soy candles come in a variety of aromas, from Cabernet to Riesling to a limited edition “Wine under the tree.” $28. Hostess gift. The Volére Wine Couture handbag is a fun and memorable hostess gift. Bring the Pinot Grigio or the Rosé it to a party or dinner chilled. These very stylish purses hold 1.5 liters of wine, which is a magnum (equal to 2 wine bottles). The wines, a Pinot Grigio, a Rosé and a Merlot Pinot Noir blend, are made in Italy by Cantina Soave and packaged in these bag-in-box “handbag” dispensers – something any WineFashionista would want. There’s a spout on one side of the bag for easy pouring. Plus the display is très chic. $14.99 for 1.5 liters. Wine tasting kits. 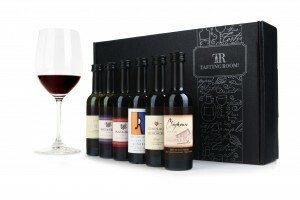 TastingRoom.com keeps adding more and more wines to its wine tasting samplers. Celebrity chefs have teamed up for their Chefs + Corks samplers. For this holiday season, Emeril Lagasse shares his favorite wine picks in two samplers: Emeril’s Holiday Party Sampler (pictured) and Emeril’s Everyday Sampler. There’s a card that has information about each wine and winery and includes Emeril’s food pairing suggestions. Each bottle is 50 ml (1.7 oz). For the holidays Emeril recommends the Patz & Hall Sonoma Coast Chardonnay with oysters and the Gundlach Bundschu Merlot with veal chop and crawfish. $32.95-$39.95. Wine books. Who doesn’t love a good read, especially by the fire, with a glass of wine during the holidays. 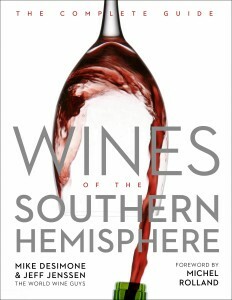 Be an armchair traveler on a journey through the Wines of the Southern Hemisphere: The Complete Guide by Mike Desimone and Jeff Jenssen, aka the World Wine Guys. They tell you everything you need to know, including the wine history, varietals, regions and wineries of each grape growing country. $24.95. You can take a trip to Italy, where Amarone is king in Valpolicella. 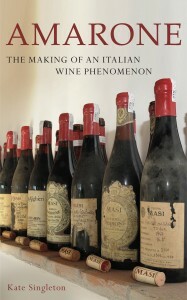 Amarone: The Making of an Italian Wine Phenomenon follows the story of the Boscaini family behind the label of the Amarone they made famous, Masi Agricola. It will make you want to pour a glass to sip as you read. $24.95.